A view from the PCMA TV stage. It was 6:45 am on a Monday morning in Las Vegas. We wondered if anyone would actually show up when PCMA’s Convening Leaders’ Learning Lounge opened at 7 am. As the final countdown started, we were about to find out first hand if people would come. The doors opened at 7 am and the crowds started flowing in to the Learning Lounge. We sighed with relief. Then the adrenalin and serotonin started surging. The excitement and buzz in the room was evident. The Learning Lounge had moved from concept to reality. Professional speaker Judi Moreo in the Speaker Showcase Theater presented by Five Star Speakers. Many have asked why the Learning Lounge worked. Here are several factors that led to the Learning Lounge’s success. 1. Leaders had a vision. Freeman, PCMA, PCMA members and volunteers all had a vision for the Learning Lounge. It was to be an adult learning playground with a blend of informal and formal learning. Freeman had the physical structure and layout in mind. PCMA staff, board, committees, the Learning Lounge Task Force and the Velvet Chainsaw team added a vision for content and experience. All caught the vision on how the right environment plus the right content plus the right delivery method would lead to successful education. 2. It takes a village to create a Learning Lounge. More than 175 people volunteered their time as emcees, facilitators, leaders, planners, speakers, hosts, social media experts and task force members. Some were industry influencers. Some were from outside the industry. Some were college student volunteers. All were committed to the vision. Chris Brogan and Virtual Host Glenn Thayer on the PCMA 365 Live Studio Stage. 3. The Learning Lounge philosophy was based on research on how adults learn. The science and research of how adults learn was practiced and applied. Content was chunked into 15-minute TED style presentations to accommodate the brain’s limited attention span. Attendees could customize their experience by picking presentations from seven themed theaters. Attendees did not have to fully commit to a sixty- or ninety-minute presentation. They could customize the experience with several short, succinct presentations that met their own personal needs. Presentations were problem-centric, not content-centric. Presentations were scheduled around themes to help with learning and retention. Common meeting and event problems were addressed. Informal and intimate learning environments were used. The informal and intimate experience served as a catalyst to learning. People were encouraged to connect, discuss, move to a presentation that met their needs and engage. The Social Media Expert bar served as a personal help desk for those who had questions regarding social technologies. Information and learning occurred within and outside of the conference four walls. 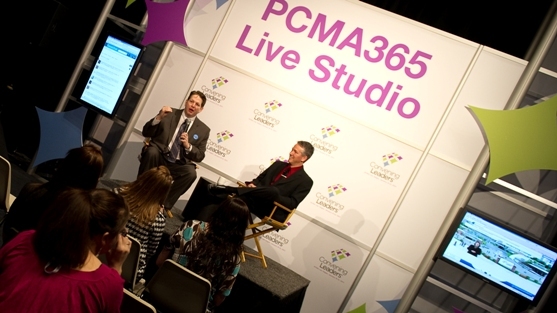 The PCMA 365 Livestreaming stage was the perfect place for a meetings talk show. Virtual emcee Glenn Thayer interviewed a variety of PCMA leaders and speakers about specific event and meeting best practices. He engaged both the face-to-face and remote audiences. Learning can be fun and exciting. 4. Freeman and PCMA converted a non-conventional venue into an inviting, informal space that encouraged learning and sharing. The space, the schedule and the content all blended seamlessly to create an unusual and inviting learning experience. 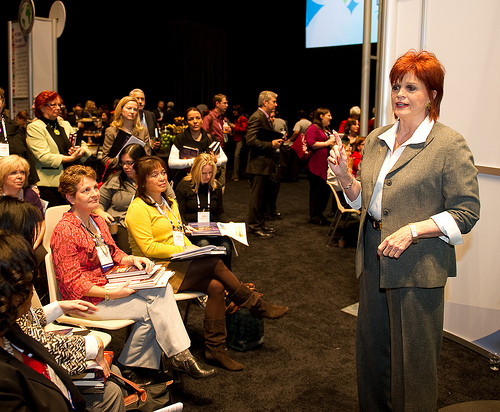 If you attended the Learning Lounge, what did you like the most? What questions do you have about the Learning Lounge? All photos by Chuck Fazio Photography. Great post Jeff! I couldn’t agree more, considering I was there both as a speaker and member of the audience.